1) It must be remembered that if asked what these tubes are, we say: “these are artist colors made with vegetable oil and no solvents“- rehearse saying this in front of the mirror. This statement comes from Bob Gamblin, the president of one of America's premier paint companies (excuse me... one of the companies who make artists colors with vegetable oil and no solvents!). Seven years ago, on a trip to Oaxaca, Mexico security guards had me open my valise, looked at my paints and asked me what they were. I used the above description and they seemed ok with that. They let me through with them. 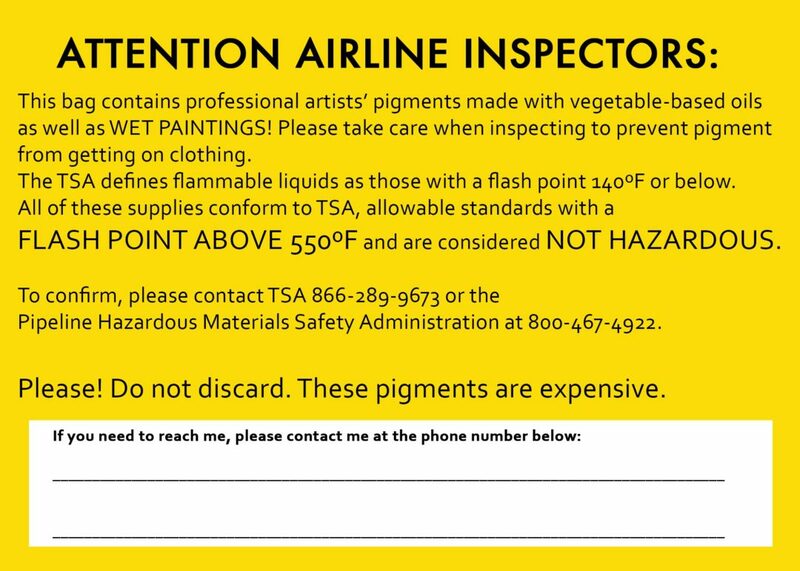 All of the color manufacturers have Material Safety Data Sheets (MSDS) for each color they make, and you might want to deal with carrying them with you and showing them to the TSA people. They are written including all the information about flash points, etc. I never carry them but that's my choice. 2) I recommend putting your colors in your valise with the rest of your possessions - NOT in a separate valise. Putting them in a separate valise just attracts more focused attention. You can put them into one of those toiletry zippered bags. 3) You could consider repackaging your colors in unmarked tubes. Classic Oils used to sell these unmarked tubes but I'm sure you can find them elsewhere. Again, I don't bother doing this either. 4) It goes without saying - but I'll say it anyway - don't bring your colors onto the plane with you. You can bring your easel on board, but not your colors and perhaps not even your brushes as they could be seen as possible weapons. 5) You could ship your supplies to your destination to avoid all this. That's much easier if you're flying in the US, but if you're going to another country you might find it too costly. In France you might pay customs just to pick up what you shipped. I shipped my colors to a friend in Paris in advance of a trip several years ago and had to go to a location in Provence, to the customs office, to claim them. I paid about $100 to get them. Not a great option. 6) Don’t forget that in the worst case you might have to buy some paints overseas- not the end of the world. There are a number of decent art supply stores throughout Europe and Mexico so that you could have what you need without dealing with taking the colors with you. No matter where I take my groups I know where the art supply stores are. They always come in handy. The only place where you won't be able to find art supplies is in Cuba. Even well known Cuban artists have to import their supplies from other countries. This brings up an amazing fact: paint thinner is hard to find in Cuba so what do artists use? Gasoline! Q. Can I fly now with my oil colors? A: Artists' oil colors contain no solvents so they are not hazardous. When security asks, "What kind of paints are these?" Never say oil paints; say that "these artists paints are made from vegetable oil and contain no solvent." For air travel, flammable liquids are those that have a flash point 140 degrees F. or below. If you do not know the flash point of your mediums or solvent, do not take any on board. Check to see if you can purchase mediums and solvents at your destination. If not, ship art materials ahead by ground transportation. Using the US Postal Service, artists can ship materials anywhere in the world. Specify "ground transportation". Gamblin makes a solvent that is flyable called Gamsol . You can buy this before you leave or just pick up a bottle of White Spirit when in France. It's available everywhere and is paint thinner. If you prefer odorless thinner we might be able get that at a good art supply store, but the smaller the town the less likely we'll be able to find that. White Spirit on the other hand is available even in ordinary grocery stores. Gamblin has just announced (November 2015) the addition of solvent free painting mediums! Read about it here. That's the summary folks. If you do everything right does that guarantee that you won't have your materials taken away? Nah, but it's so rare and remember that even in the worst case you WILL wind up painting even if you have to purchase supplies when you arrive.